Meet Alexander Calder. The man that made modern art move! 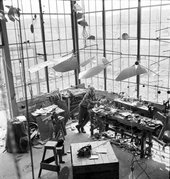 Calder, known to his friends as ‘Sandy’, invented the mobile in 1931 when he decided to create a drawing in the air! The artist Marcel Duchamp called Calder’s sculptures’ ‘mobiles’ because they moved when the wind blew. Here is one of his mobiles made in 1953. How do you think it moves? Calder’s mobiles were also inspired by nature, such as Snow Flurry I. Do you feel caught in a blustery snowstorm? Calder was born in Pennsylvania, USA in 1898 into an artistic family, his grandfather, his father and his mother were all artists. However, as a kid he was great at Maths, so he decided to study engineering at university. This turned out to be very useful later on when he was inventing his kinetic sculptures. Kinetic is used to describe a type of art that moves, either by air or the use of a motor. 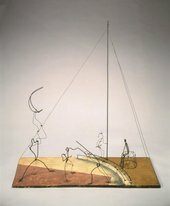 In 1926 Calder made a miniature circus out of wire and bits of cork and fabric. He called it the Cirque Calder, and artists like Pablo Picasso were invited to come and watch performances. As a kid, Calder loved the circus, especially the acrobats. He was impressed by their ability to balance on thin wires high up in the air. Have you been to the circus? Do you think Calder captures the magic of a circus performance? In 1930 Calder visited the artist Piet Mondrian in his studio in Paris where he saw his simple paintings of rectangles and stripes in red, yellow and black. He thought it would be good if the shapes in Mondrian’s paintings moved, so he went back to his studio and began to work on a series of sculptures that would do this. Alexander Calder, Small Sphere and Heavy Sphere, 1932-1933, Fer, bois, cordes, tiges et objets divers, H. 317,5 cm (dimensions variables) New York, Calder Foundation. Calder also loved involving sound in his artwork. 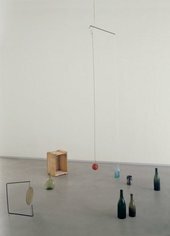 In Small Sphere and Heavy Sphere two balls hit bottles, a box, a can & gong. How do you think it sounds? 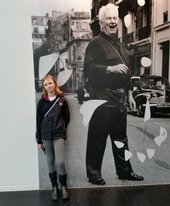 Calder made new ways of looking at and creating art. What do you think about his work? Does it remind you of anything you have seen before? Have you ever tried to make a mobile?